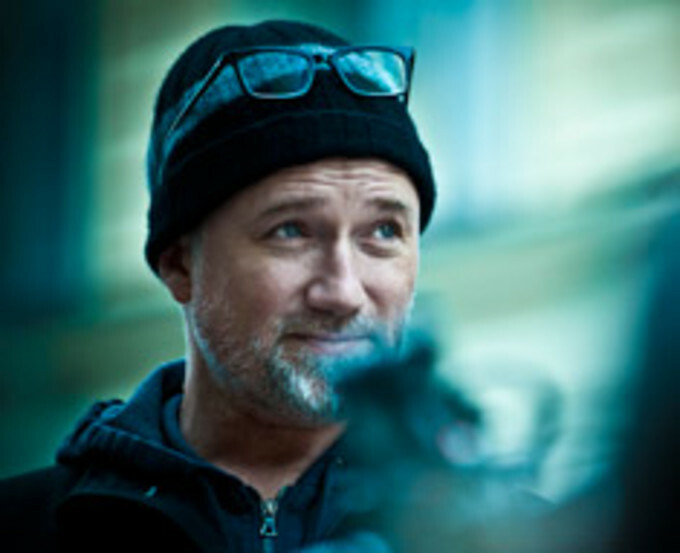 Any new David Fincher film is a reason to celebrate. 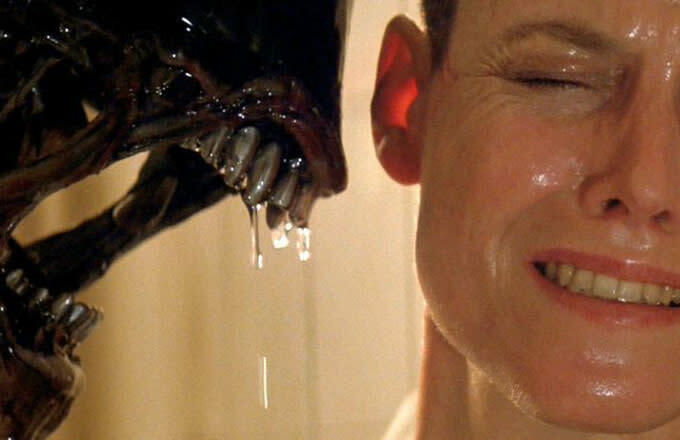 In the 22 years since his first feature, Alien 3, the director has delivered fan-favorite classics like Seven and Fight Club, a fierce awards contender in The Social Network, and one of the greatest films of the millennium, Zodiac. Even the blemishes in Fincher’s career—Alien 3, Panic Room, The Curious Case of Benjamin Button, and The Girl with the Dragon Tattoo—are solid, some more harshly received because they couldn’t stand as tall the director’s highlights. With the exception of Paul Thomas Anderson (whose Inherent Vice premieres at the New York Film Festival on Saturday), there’s no other filmmaker whose films I anticipate with the same fervor. Sorry, Tarantino and Nolan die-hards, but your boys just don’t register on Fincher’s level. Fincher’s latest, Gone Girl, opens in theaters tomorrow. Based on Gillian Flynn’s whip-smart and trashy best-selling novel, Gone Girl is the director’s wonderfully bravura tenth movie. Flynn’s devilish tale of a wife (Rosamund Pike) who goes missing, leaving behind only a diary of her marriage and an incriminating crime scene that implicates her husband (Ben Affleck), is right in the director’s wheelhouse. 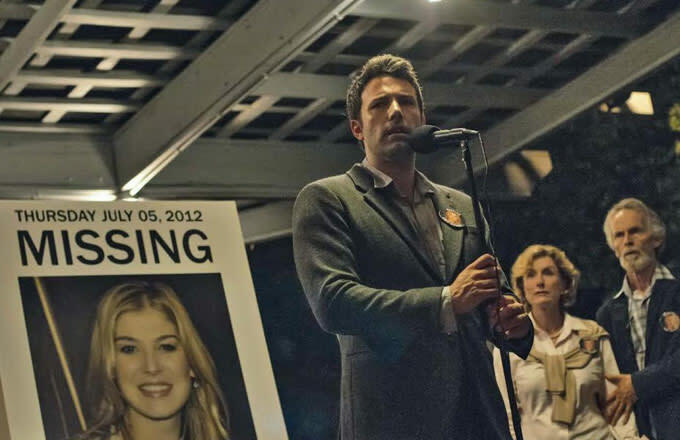 It’s not just because Fincher currently holds Alfred Hitchcock’s torch as the master of suspense—Gone Girl is Fincher material right down to the exposed bone marrow and the latest proof of what we suspected all along. Fincher is a bona fide auteur, not in the superficial way that many of his contemporaries are complimented but in the way that the cinematic term "auteur" was derived by the New Wave directors in the ‘60s. Looking for a way to distinguish the author of a film (producers were often credited while directors were hired hands), critics like Francois Truffaut noted that filmmakers of Hitchcock’s variety developed a consistent voice throughout their work, despite the variances in subject, writer, and genre and the non-personal mode of filmmaking that the Hollywood studio system nurtured. Unlike Anderson, Tarantino, and Nolan, Fincher has never been credited with writing any of his films, forgoing the more hands-on method of catering a project to one&apos;s own tastes. And he has worked within and fought against the soul-crushing Hollywood studios since his very first movie, the unfairly maligned Alien 3 (1992). Yet if you take one look at that third installment of the coveted sci-fi/horror franchise, his signatures are all over it: the precise compositions, fluid tracking, low angles, cool lighting, and how he exacts his actors’ performances through an extreme amount of takes. The director admits that he only got a handle on his game and fully matured as a filmmaker while making Zodiac (2007). But his entire body of work is consistent with the development of an auteur. While Fincher&apos;s new hotly anticipated, best-seller adaptation has Gillian Flynn as its author and screenwriter, it seems as though she wrote it in a David Fincher state-of-mind. As Fincher’s tenth film, Gone Girl is the perfect little prism refracting the long-held style, themes, and obsessions of its filmmaker. Like a “Best of David Fincher” highlight reel, it has the trashy fiction of Se7en (1995) and The Girl with the Dragon Tattoo (2011) and the unreliable narrator (I won’t spoil whom) of Fight Club (1999). The way the television media pounces on, exploits, and spins the mystery at Gone Girl’s center will remind you of Zodiac. Meanwhile, Flynn’s perceptive tale of a well-heeled couple struggling with financial hardships also touches on issues of class and entitlement that are featured in almost all of Fincher’s work, including Fight Club, Panic Room (2002), and The Girl with the Dragon Tattoo. In The Social Network (2010), Jesse Eisenberg’s Mark Zuckerberg is driven to upstage those rich, spoiled Winklevoss twins (Armie Hammer). In Se7en, a serial killer with inherited money to burn is emboldened to teach everyone a lesson by making victims of sinners, many of whom live in less fortunate scenarios. The poverty displayed in the film is almost as disgusting as the murders. In the subversive thriller The Game (1997), Michael Douglas’ financier Nicolas Van Orten has Gordon Gekko money but gets a taste of regular folk when a twisted corporation does him like the recession and takes everything he’s got. Even Alien 3 tells the story of a dank and dreary planet made up of social outcasts who are disrupted by the arrival from up on high of Ripley and the Queen residing in her womb. The most intriguing aspect in Fincher’s best work, Gone Girl included, is the way he engages with storytelling in form and content. This is perhaps the reason why Fincher has frequented thriller territory, where he plots and paces, piecing together puzzles in a way that the act of storytelling is often more intriguing than the bigger picture. In both Se7en and The Game, the main characters are simply pawns following along on a story—a mystery thriller—that has been written for them. These characters are almost as inactive as the audience watching the film, simply observing a story as it unfolds on top of them. At one point, Morgan Freeman’s Detective Somerset comments that his primary role is to document a plot as it goes, without ever getting ahead of a story plotted by a serial killer adapting Chaucer and Milton. They do catch up to the killer once in the movie, which happens to be the direct result of going to the library. I can’t get into too much detail about how Gone Girl is exemplary for its storytelling without spoiling its twisted brilliance. There’s that aforementioned diary written by Rosamund Pike’s Amy Dunne, which narrates her marriage to Ben Affleck’s Nick Dunne in a superbly calculated way. She glosses memories so that they become almost artificially romantic, which makes you wonder whether she also heightens the fractures in a relationship gone sour. When Nick Dunne becomes the prime suspect in Amy’s disappearance, the entire film becomes about storytelling. He must position and narrate their marriage to the police, media, and even the missing woman, all of whom are active storytellers in their own right. As with Gone Girl, each main character in The Social Network and Zodiac is a storyteller. The former film frames the events surrounding Mark Zuckerberg and Facebook’s creation as a legal deposition, where competing perspectives collide and yet seamlessly create one fluid (thought not necessarily factual) recreation of what happened. Zodiac, Fincher’s masterpiece, is about the obsession to frame an unknowable truth into a satisfactory narrative. The central murders are complete within the first half-hour but the movie continues to follow the aftermath, where the storytelling becomes the subject. Mark Ruffalo’s Detective Toschi, Robert Downey Jr.’s reporter Paul Avery, and Jake Gyllenhaal’s cartoonist-turned-novelist Robert Graysmith are all searching for a way to put their finger on the truth by compiling the events and evidence surrounding the titular killer and building a narrative that connects. Even the Zodiac killer contributes to the narration, writing letters of his murders and more, trying to spin the story his way. 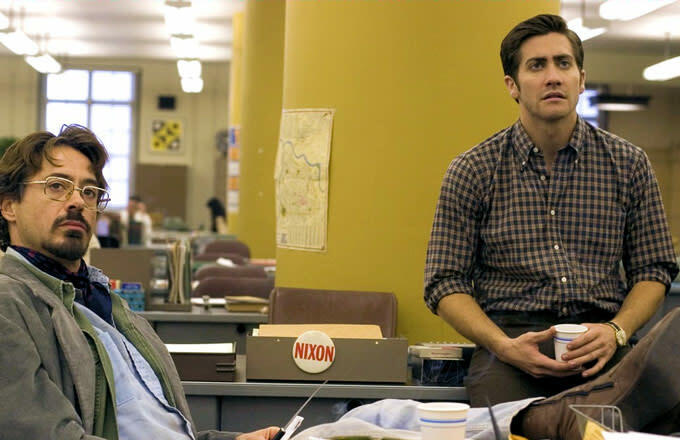 In Zodiac’s powerhouse climax, Ruffalo’s Toschi instructs Gyllenhaal’s Graysmith to “finish the book” he intends on writing. The entire, complicated mess of a murder mystery gets resolved by one man’s commitment to become an author. This is a direct response to Graysmith’s assertion surrounding his version of the Zodiac killings: “Just because you can’t prove it doesn’t mean it’s not true.” There’s something almost biblical about this exchange, where the act of storytelling takes on religious proportions, becoming a leap of faith for the audience and in turn lending the author divine qualities. Fincher, admittedly not a religious man, frequently ponders the God-like nature of the author in his films. Consider the omniscient force that is the serial killer in Seven, enacting God’s work on sinners; or the mysterious corporation in The Game that, in a telling image, allows Van Orten to dig himself out of a grave, dressed in white, so that he can stand among crucifixes, resurrected. The brilliant last act in Fight Club has Edward Norton’s nameless (for a time) narrator trying to put a stop to the society-correcting apocalypse Brad Pitt’s Tyler Durden has written out. Like the detectives in Seven or The Game’s Van Orten, whose free will is always in question, Norton’s character is always one step behind what Durden has plotted. Durden, for a time, is an omniscient force who happens to have religious followers and, like God, may not actually exist. I can’t say whether Fincher’s fatalistic treatment of “the author” as an omniscient, God-like force spills over into Gone Girl. It’s too early to consider in a complex and exceptionally entertaining film that demands and deserves multiple viewings. However, one of its narrators, the missing Amy Dunne, does take on some Virgin Mary qualities. 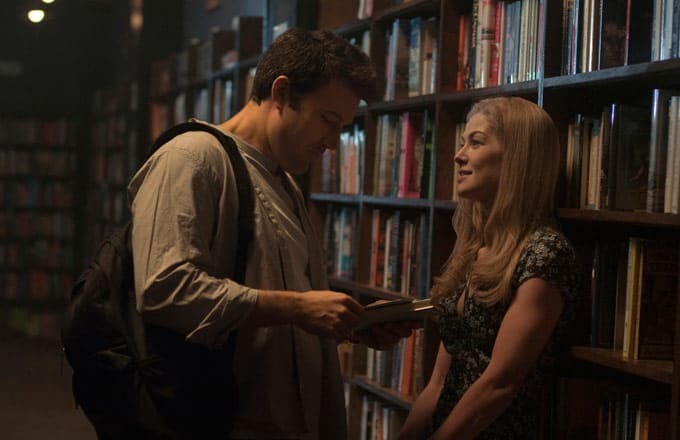 At the least, Gone Girl is about storytelling. If Fincher has been saying anything about storytelling throughout his body of work, it’s that it is the closest thing we have to a religious experience. He takes us back to that scene in Preston Sturges’ classic Sullivan’s Travels, where prisoners enter a church to watch a movie, the cathartic high of Christianity transferred over to cinema. God does not exist in Fincher’s movies. There’s only the cathartic exchange between audience and that omniscient author, whether he be a serial killer, a cartoonist, Amy Dunne, or Fincher himself. Radheyan Simonpillai is a film critic based in Toronto. He tweets here.